Thanks to Roger for sending this in. Our complete archive of Caption Competitions. said Bigus Dickus on September 15, 2008 3:04 PM. The next administration promised not to cut spending on the Arts, but they might modify them a little bit. said E on September 15, 2008 3:09 PM. said ConservaLiberCrat_08 on September 15, 2008 3:12 PM. Gov. Palin's security team in training. said ConservaLiberCrat_08 on September 15, 2008 3:14 PM. said ConservaLiberCrat_08 on September 15, 2008 3:15 PM. said sarcastic one on September 15, 2008 3:16 PM. said sarcastic one on September 15, 2008 3:17 PM. Check out the guy in the back--so THAT'S what Dave did on his summer vacation!!! said sarcastic one on September 15, 2008 3:20 PM. If this website locks up one more time, we're going to shoot the person in charge! said sarcastic one on September 15, 2008 3:21 PM. How the young Radio City Rockettes take out the old Radio City Rockettes. said Baierman on September 15, 2008 3:22 PM. said ConservaLiberCrat_08 on September 15, 2008 3:28 PM. Initially the International Olympic Committee's decision to combine Synchronized Swimming and Biathlon seemed like a good idea. But the sights on the training muskets were a little off. Training turned into a disaster quickly. Becky Martin never did reach her dream of becoming an Olympian. Bless her soul. said Johnny Wright on September 15, 2008 3:29 PM. said ConservaLiberCrat_08 on September 15, 2008 3:35 PM. said ConservaLiberCrat_08 on September 15, 2008 3:41 PM. said ConservaLiberCrat_08 on September 15, 2008 3:49 PM. said stickyboy on September 15, 2008 3:50 PM. nice CLC--Steve would be proud! said sarcastic one on September 15, 2008 3:52 PM. I had heard that Iraq was recruiting women into their police force...now I have proof! said sarcastic one on September 15, 2008 3:53 PM. The Bon Jovi ballet....including "shot through the heart" and "living on a prayer"...encore is to "wanted dead or alive"
said sarcastic one on September 15, 2008 3:55 PM. said sarcastic one on September 15, 2008 3:57 PM. Year after year, the dancers were subjected to the same boring Nutcracker choreography. This year, they took matters into their own hands. said AGray on September 15, 2008 3:59 PM. said sarcastic one on September 15, 2008 3:59 PM. I've heard that ballet dancers have body image issues...but damn...shooting the mirror won't solve anything! said sarcastic one on September 15, 2008 4:00 PM. The judge knew it would be a controversial decision, but who was he to deny John Wayne Gacey the constitutional right to choose his method of execution. said Scaramouch on September 15, 2008 4:01 PM. It was only when he attended his surprise homecoming party at the Utah YWCA that Warren Jeffs realized how much his girls had turned against him. said Scaramouch on September 15, 2008 4:06 PM. Instructor: "Okay ladies! We're gonna pretend that's Chuck Barris in front of you... Ready? Aim. FIRE!" said ConservaLiberCrat_08 on September 15, 2008 4:10 PM. "Remember ladies, don't shoot until you see the tights of their thighs." said Royal Cyclops on September 15, 2008 4:19 PM. said sarcastic one on September 15, 2008 4:20 PM. Send the Chinese Gymnastic team. said Leonardo Carvalho on September 15, 2008 4:22 PM. That's what happen when you trust your ballet group to a guy who has a marshmellow head. said Leonardo Carvalho on September 15, 2008 4:24 PM. said sarcastic one on September 15, 2008 4:25 PM. said Dave on September 15, 2008 4:27 PM. said Leonardo Carvalho on September 15, 2008 4:40 PM. Ladies and Gentlemen this old revolutionary war photo of the British, gives us a clue as to why we celebrate Independence day. Sorry Scaramouch, it was Johnny's idea. said Dave on September 15, 2008 4:43 PM. said sarcastic one on September 15, 2008 4:45 PM. Be advised Ebert, this is one troupe that will fire back at their critics. said E on September 15, 2008 5:08 PM. Now we know the Stormtroopers' dark secret. said etantao on September 15, 2008 5:20 PM. Tonight on the season premier of So You Think You Can Dance, the winners. said Paul on September 15, 2008 5:35 PM. said sarcastic one on September 15, 2008 5:38 PM. said Paul on September 15, 2008 5:49 PM. Again, the Warriors found themselves in the wrong neighborhood. said Paul on September 15, 2008 5:53 PM. 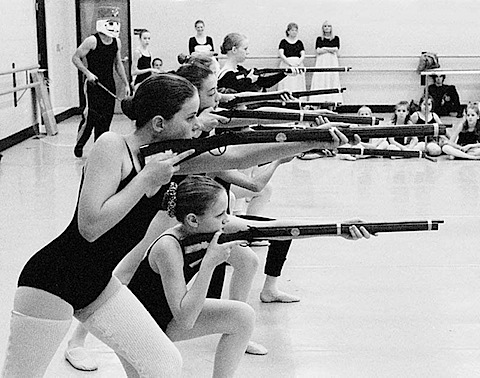 Is the average Navy Seal as good a ballet dancer as these girls are marksmen? Truly, it is to ponder. said E on September 15, 2008 5:54 PM. said Angie on September 15, 2008 6:03 PM. Maybe I'm getting a little prudish in my old age but the tampon commercials these days are a tad much. said E on September 15, 2008 6:25 PM. 'You go gurrrl!' - Oprah. said E on September 15, 2008 6:35 PM. At your command, Lord Vadermuffin head. said Leonardo Carvalho on September 15, 2008 6:37 PM. "Tampax--Stopping Aunt Flo dead in her tracks"
said sarcastic one on September 15, 2008 6:39 PM. SarcOne - you had me at Tampax. said E on September 15, 2008 6:43 PM. Looks like Hollywood is still trying to figure out how to make Chick Flicks appealing to men. said E on September 15, 2008 6:44 PM. Since moving to Oklahoma the Supersonic just haven't been quite the same. Oh, wait they are the same. said Dave on September 15, 2008 6:45 PM. said E on September 15, 2008 6:46 PM. "At your command, Lord Vadermuffin head." That's my favorite so far. Other than mine of course. said Johnny Wright on September 15, 2008 6:57 PM. said E on September 15, 2008 7:06 PM. said E on September 15, 2008 7:46 PM. "No, no, NO!! Not *engage*... Dégagé!!!" said TeaFizz on September 15, 2008 9:02 PM. Baryshnikov was denied his final request. said TeaFizz on September 15, 2008 9:05 PM. I'd buy that they're doing the ballet version of Les Miserable or the Battle of Bunker Hill, but marshmellow head totally gummed up the works there. Did I miss that chapter in school or what? The gummy head era? said E on September 15, 2008 9:24 PM. I hate to break the news to y'all, but that IS the same old boring Nutcracker choreography. Marshmallow head is the Nutcracker, sans most of his military uniform. He's commanding the toy soldiers in the battle against the Mouse King. I have two little girls, so I've seen it way too many times. Someday I will see this ballet under the influence, and it may be better. said Miss Cellania on September 16, 2008 6:13 AM. said ConservaLiberCrat_08 on September 16, 2008 9:19 AM. said ConservaLiberCrat_08 on September 16, 2008 9:24 AM. The Girl Scouts' new marketing strategy. said ConservaLiberCrat_08 on September 16, 2008 9:29 AM. Actually, CLC, these are the UNNA Girl Scouts. Selling cookies is for losers. said Leonardo Carvalho on September 16, 2008 9:47 AM. A scene from the movie "Step Up 4"
said Dwight on September 16, 2008 4:09 PM. The Imperial Military and Dance Academy of Corellia: Women's Division. said Lucas on September 16, 2008 10:27 PM. Ms Cellani, If Ida known The Nutcracker had all the guns and shiz maybe I woulda checked it out. I assume the terrorist guy Nutcracker caves after their righteous assult so no need to see it now. I'll have to wait for the next ballet/opera/whatever about violent kitchenware, sigh, I guess. said E on September 17, 2008 2:15 AM. Ballet is for pussies, they said. Who wants to spin around in a leotard, they said.......they had nothing else to say after my first recital. said Twitch on September 17, 2008 4:30 AM. I didn't know that "Brady Bill" had a "dance art" institute. said phatlard on September 17, 2008 6:11 PM. said LaxJ13 on September 27, 2008 10:07 AM.